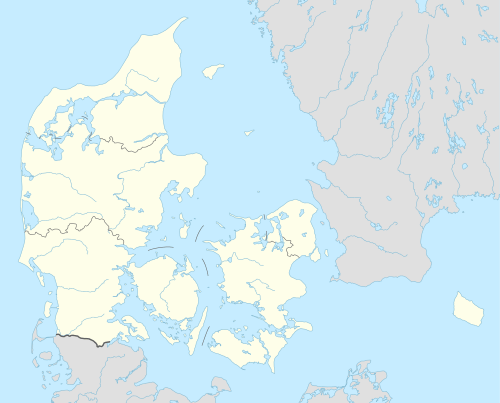 The Danish Superliga (Danish: Superligaen, pronounced [ˈsuːˀb̥ɐliːɡ̊æːˀn̩]) is the current Danish football championship tournament, and administered by the Danish Football Association. It is the highest association football league in Denmark and is currently contested by 14 teams each year, with 2 teams to be relegated. 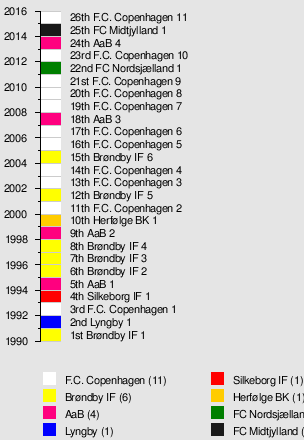 Founded in 1991, the Danish Superliga replaced the Danish 1st Division as the highest league of football in Denmark. From the start in 1991, 10 teams were participating. The opening Superliga season was played during the spring of 1991, with the ten teams playing each other twice for the championship title. From the summer of 1991, the tournament structure would stretch over two years. The 10 teams would play each other twice in the first half of the tournament. In the following spring, the bottom two teams would be cut off, the points of the teams would be cut in half, and the remaining eight teams would once more play each other twice, for a total of 32 games in a season. This practice was abandoned before the 1995–96 season, when the number of teams competing were increased to 12, playing each other thrice for 33 games per Superliga season. For the first season of this new structure, Coca-Cola became the name sponsor of the league, which was then named Coca-Cola Ligaen. 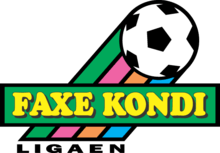 After a single season under that name, Faxe Brewery became sponsors and the league changed its name to Faxe Kondi Ligaen. Before the 2001–02 season, Scandinavian Airlines System (SAS) became the head sponsor, and the name of the tournament changed to SAS Ligaen. From January 2015 the Danish Superliga is known as Alka Superliga, as the Danish insurance company Alka became name sponsor. Following the 2015–16 season, the league was expanded to 14 teams, accomplished by relegating only the last-place finisher in that season and promoting the top three teams from the 1st division. The 2016–17 season is the first for a new league structure. It begins with the teams playing a full home-and-away schedule, resulting in 26 matches for each team. At that time, the league splits into a six-team championship playoff and an eight-team qualifying playoff. All teams' table points and goals carry over fully into the playoffs. In the championship playoff, each team plays the others home and away again. The top team at the end of the playoff is Superliga champion and enters the UEFA Champions League in the second qualifying round. The second-place team enters the UEFA Europa League in the first qualifying round. The third-place team advances to a one-off playoff match for another Europa League place (if the winner of the Danish Cup finishes in the top three, the match will instead involve the fourth-place team). The qualifying playoff is split into two groups, with the teams that finished the regular season in 7th, 10th, 11th, and 14th in one group and those finishing 8th, 9th, 12th, and 13th in the other. Each group plays home-and-away within its group. The top two teams from each group then enter a knockout tournament, with each match over two legs. If the Danish Cup winner is among the top two finishers in either playoff group, it is withdrawn from the knockout playoff and its opponent automatically advances to the tournament final. The winner of that tournament faces the third-place (or fourth-place) team from the championship playoff in a one-off match, with the winner entering the Europa League in the first qualifying round. The winners of the semifinals advance to the final. The losers of the semifinals then play over two legs, with the winner remaining in the Superliga and the loser dropping to the 1st Division. The winner of the final plays the 1st Division runner-up, and the loser of the final plays the third-place team from the 1st Division, also over two legs. In each case, the winner plays in the next season's Superliga. As of 2008, Modern Times Group owns the rights to broadcast all of the matches from the league, and uses them to broadcast matches on channels TV3+ and TV 2 Sport (through sub licensing). However, the current deal was found by the Danish Competition Authority (Konkurrencestyrelsen) not to comply with the Danish competition legislation. Therefore, a new deal was made on 21 December 2008, dividing the Superliga TV-rights between three parties. The deal amounted to DKK 1,062,300,000 (USD 210 million, EUR 140 million), effective from the 2009–10 season. ^1 Channels that are likely to broadcast the matches. ^2 Original buyers were DR and Telenor in a consortium, but they sold the rights to Bonnier Group. ^3 The fourth choice was originally at Modern Times Group, but they have chosen to give it to TV 2 Sport. Outside of Scandinavia, IMG holds the rights to the Superliga until the 2011–2012 season, and they have reportedly sold the rights to networks in Greece, Cyprus and the United Arab Emirates, as well as several betting sites. It airs on Terra TV in Brazil. 1 2 3 4 Tally includes points carried over from the first half of the season. ↑ "FLEST KAMPE, ALLTIME". superstats.dk. Retrieved 20 October 2016. ↑ "UDLÆNDINGE MED FLEST SPILLEDE KAMPE, ALL TIME". superstats.dk. Retrieved 17 August 2013. ↑ "DIF slår fast: Brøndby uden tilskuere i to kampe". Tipsbladet. Retrieved 25 May 2013. ↑ Ritzau (21 December 2007). "Fakta om fodboldaftalen (lit. Facts about the football agreement)". TV 2 Sporten. Retrieved 2 January 2008. ↑ Ritzau (21 December 2007). "Dansk fodbold solgt for 1 mia. (lit. Danish football sold for 1 billion)". TV 2 Denmark. Retrieved 2 January 2008. ↑ "IMG to represent Danish Superliga for three seasons" (Press release). IMG. 17 June 2009. Retrieved 20 February 2010. ↑ Olsen, Theis L. (19 February 2010). "Superliga-bold på skærmen i Dubai og Grækenland". business.dk. Berlingske Tidende. Retrieved 20 February 2010.